Just a single tree is capable of supporting hundreds of different species – birds nest within the branches, lichens grow on the trunks, blossom attracts lots of insects in spring, and the fruits and seeds provide a food source for birds and small mammals. Nooks and crannies within the bark of older trees are an excellent home for invertebrates and even small bats. 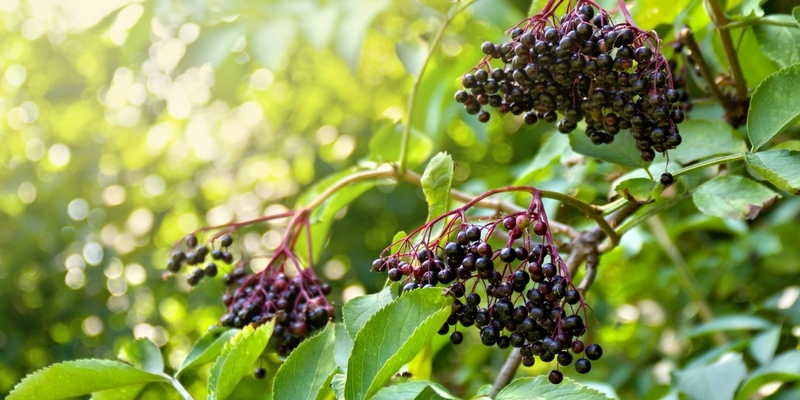 In this article, we’re going to look closely at nine trees of all shapes and sizes that you should consider planting in your garden if you’d like to attract birds, bees and wildlife and help the local ecosystem. Crab Apple trees are a wild species that are closely related to the cultivated apple which displays sweetly-scented, white blossom in the springtime. The wood from the crab apple tree had a long association with love and marriage and was a big part of the Celtics’ fertility festivals, during which they would burn log after log. Average Height: It can grow up to a maximum of 7-9 metres high, but it can be pruned to keep it at a more manageable size. Ideal Conditions: Normally prefers the sun or slight shade, but will thrive in most soil types. Wildlife Profile: The blossoming flowers provide an excellent source of food and nectar for insects, particularly bees. Birds such as the song thrush, blackbirds and redwings love the fruit. But expect to have a few furry visitors such as mice, badgers, dormice and voles, who are also known to enjoy them. How We Can Use It: The apples contain high levels of pectin, which makes them ideal for making jams and preserves because they set naturally. Can also be used for adding a depth of flavour to ales and punch. Elder isn’t a massive tree, but it’s undoubtedly one of the most popular and can be found in gardens up and down the country. Our ancestors believed that if you were to burn elder wood, you’d come face-to-face with the devil. But if the tree itself was situated near your home you’d keep the devil and his minions away. 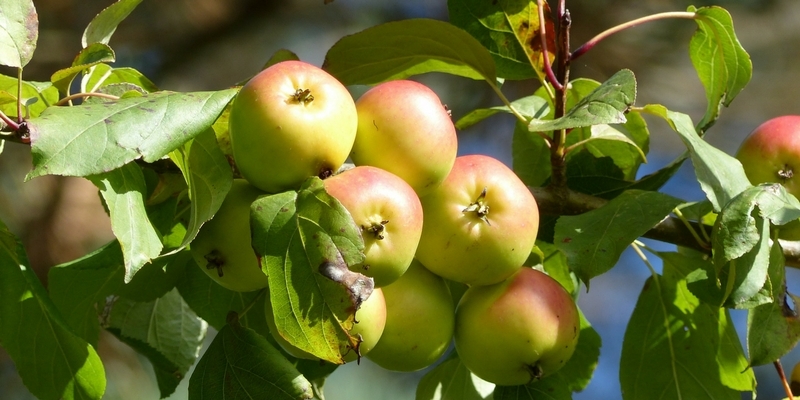 Average Height: It will grow up to 10 metres and maybe a little higher, but as with the crab apple, most prefer to keep the size in check with pruning. Ideal Conditions: Grows pretty much anywhere, but does prefer rich and fertilised soil. Wildlife Profile: The flowers provide nectar for insects, and the berries are eaten by dormice and bank voles. Many moth caterpillar species, such as the dot and the swallowtail, feed on the plant’s foliage. How We Can Use It: The flowers are most commonly associated with wine and tea making. The berries are rich in vitamin C and are used to make wine and filling for pies. Beware though, the fruit is poisonous if eaten raw. Blackthorn has long been connected with witchcraft as it was said that wands were made using the wood from the trees. The thorns make this tree a very popular option for many gardeners as an unconventional hedging plant. It produces white flowers during the spring and sloe fruits towards the end of summer. Average Height: The Blackthorn will grow to a maximum of about 6-7 metres, which makes it an ideal choice for a hedging plant. Ideal Conditions: Grows well in moist, well-drained soil in full view of sunlight. Wildlife Profile: Because it flowers quite early it provides a priceless source of nectar and pollen for bees in the springtime. The foliage is an important part of the diet of many native moth caterpillar species, and the thorny foliage provides the ideal protection from predators for nesting birds. 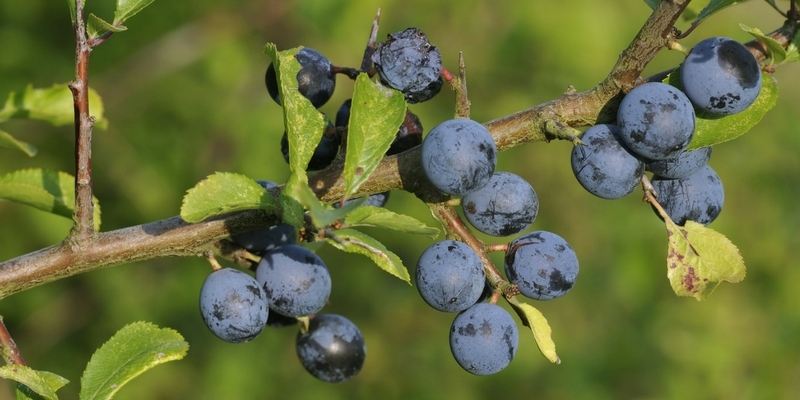 How We Can Use It: Sloe fruits are used in making wine, preserves, and, obviously, gin. Wild Cherry is famous for its blooms of bright white blossoms and, of course its tiny deep flavoursome fruits, which add a splash of colour to any garden scene in the summer. During autumn the leaves transform to layered crimson, which adds a warming feel to a garden preparing for winter. Average Height: Can grow to pretty huge proportions in comparison to some of the smaller trees on our list and can end up anywhere between 18-25 metres tall. 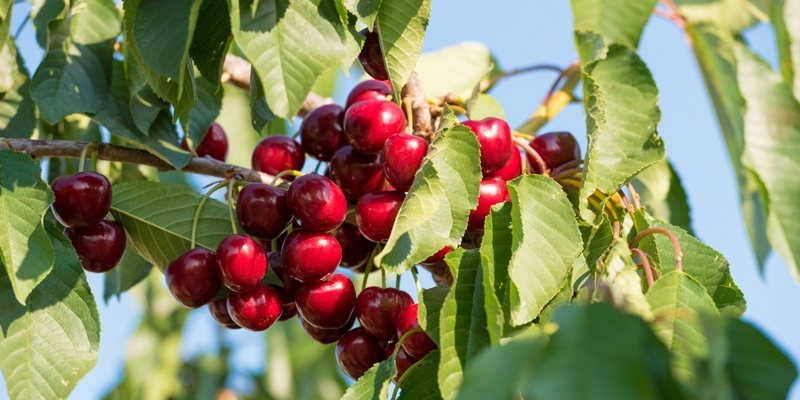 Ideal Conditions: Cherry trees thrive in full sunlight and enriched fertile soil. High winds can destroy the lovely blossom; ideally should be planted in a partially sheltered location. Wildlife Profile: It’s easy to see why any gardener would love this tree in their garden. But, if you were hoping to take a few of those rich, sweet cherries for yourself, you’ll have to be quick – birds will be tucking into the fruit as soon as they’re ripe. While the blossom provides a nectar and pollen source that attracts butterflies, bees and bumble bees as well as an array of little insects which in turn helps our birds. How We Can Use It: Traditionally cherry trees were planted for food and the wood. These days cherry wood is a prized wood used in furniture manufacturing. Silver Birch known as ‘The Lady of the Wood’ is an elegant, graceful tree with airy foliage and silver, peeling silver bark. It has triangle shaped leaves that cling to its drooping, attractive branches, which turn from yellow to gold in the autumn. Catkins also develop between spring and autumn. Average Height: Grows anywhere between 15-20 metres, although mature trees can grow larger. 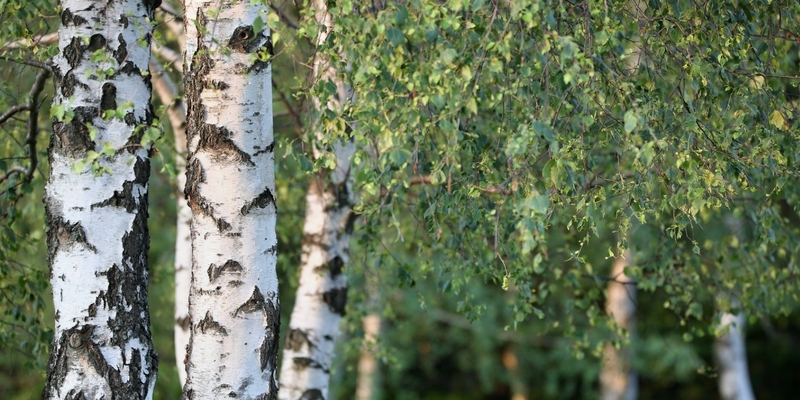 Ideal Conditions: Silver Birch will grow most anywhere despite its delicate appearance, consequently they are not too high maintenance and can grow in most conditions. Wildlife Profile: Small birds, like greenfinches and redpolls, eat the seeds and the pests that are attracted to the tree. How We Can Use It: Silver Birch wood is durable and heavy, which makes it perfect for making furniture. Of course for most of us it just give pleasure and beauty to our gardens! Rowan has silver-brown bark and ferny leaves which turn an almost orangey-red in the autumn. Cream flowers blossom in bundles, which are followed by a mass of glorious orange berries towards the end of the year. Average Height:The tree grows to a height of anywhere between 12 to 15 metres. Rowan’s are suitable for most gardens given that they are easy to grow. 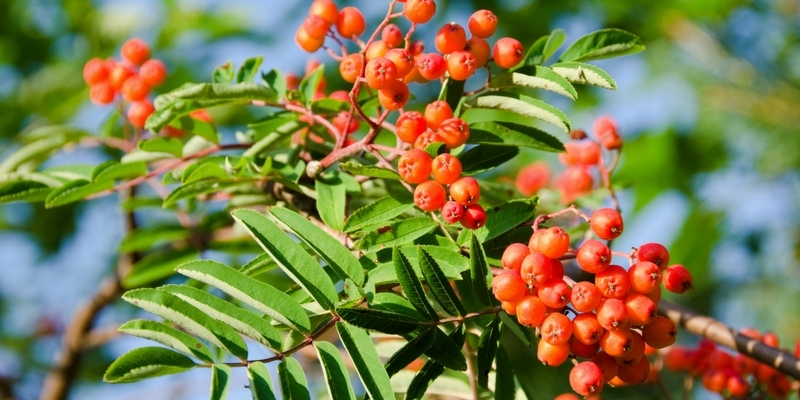 Ideal Conditions:The Rowan is a very hardy tree and as such will grow in most soil types, but ideally prefers it light and well-drained. Wildlife Profile: Moth caterpillars are often found feeding on the leaves. The flowers provide pollen and nectar for bees and other insects, while the berries are a valuable food source in the autumn for birds like blackbirds and thrushes. How We Can Use It: The acidic berries are a fantastic source of vitamin C and once cooked can make jellies for meats and cheeses. 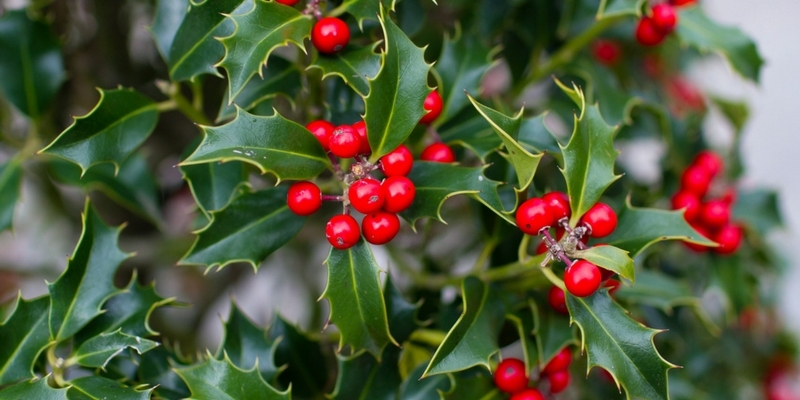 Holly is easily one of Britain’s most distinctive trees and its dark evergreen prickly leaves stand out during the winter when most trees have shed their leaves. The tree itself is fairly slow growing, which makes it perfect for any size garden. The female trees grow bright red berries that ripen in October and often stay on the tree throughout winter. Average Height: Grows as high as 15 metres, but to keep it smaller prune in early spring. Ideal Conditions: Will grow in most conditions, including shady areas. Wildlife Profile: Holly offers shelter for birds through the winter storms, and the spiny thorns mean that they are safe from predators, such as hunting cats. Hollies are very important in providing protection, shelter and food for all our birds and wildlife. How We Can Use It: The branches, leaves and berries scream Christmas and are often used to decorate and make wreaths during the festive period. Their shiny green leaves and glossy red berries give us great pleasure and cheer in the dark months of winter. In spring, Hazel bursts into a bloom of soft lambs tails catkins, which eventually turn into much prized hazelnuts, popular with passers-by and wildlife. Hazel has a reputation as a tree with quite colourful folklore. Average Height: Capable of growing to 10 metres or sometimes a little bit more. Ideal Conditions: Can grow in shade and most soils. Wildlife Profile: This tree is most closely associated with the hazel dormouse, which feeds on the caterpillars found on the leaves and the nuts themselves when preparing for winter. 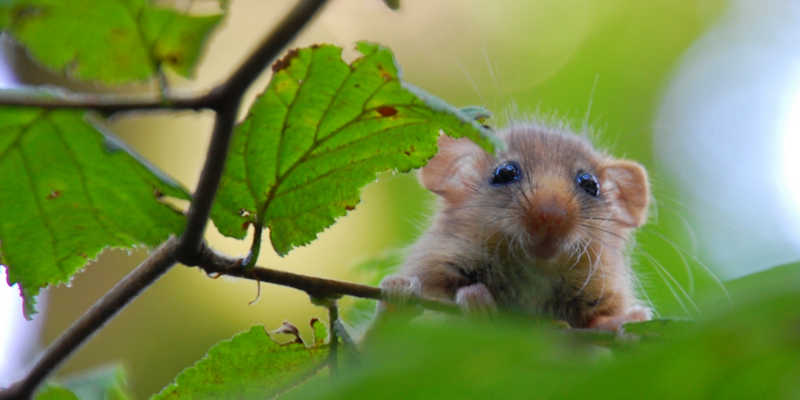 Of huge importance as the numbers on dormice is dropping drastically. Hazelnuts are also a favourite of a variety of birds and mammals like the red squirrel and bank vole. How We Can Use It: In the past, the wood was used to make net stakes, hurdles and furniture. The nuts are commonly used in cooking and snacking and were grown initially for commercial nut production. 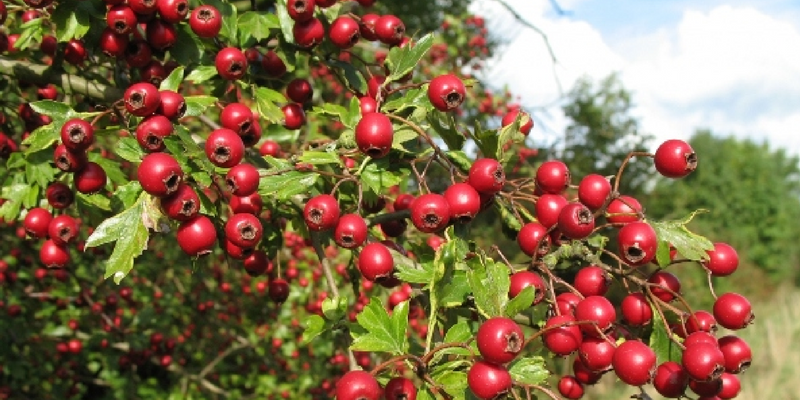 Hawthorn is great for wildlife and can be planted either as part of a hedgerow or a single tree. It displays a wonderful white blossom with a pinkish, white hue in May and bright ruby berries in summer. Average Height: If left to their own devices these trees can grow up to 15 metres. Ideal Conditions: Grows in all soils, but will blossom and flower more prominently when given warm sunshine. Wildlife Profile: As mentioned this species is wonderful for wildlife and has been found to support over 300 insect species. The flowers are loved by bees, bumble bees and butterflies and provide nectar and pollen for pollinating insects. The fruit is an important source of food for birds and wildlife. How We Can Use It: The berries are used to make berries, wines and sauces. To enter the world of trees is to enter a world rich with history, folklore and mystery. Since the world began, trees have played an important role in the survival of mankind. We use them to provide food and continuing to attract pollinating insects, such as bees is crucial to the health of human beings and that of other animals. So, when planting trees, it’s incredibly important to ask yourself, which trees will help the wildlife in my garden? If you require any advice on our products or trees and gardening in general, don’t hesitate to contact us.